Oh My Game is an entertainment zone in Good Earth City Center, Gurgaon, and they've India's largest laser tag arena, bubble football, VR gaming, an arcade and more. Laser tag, bubble football, group gaming. Oh My Game boasts of a 2,200 sq. 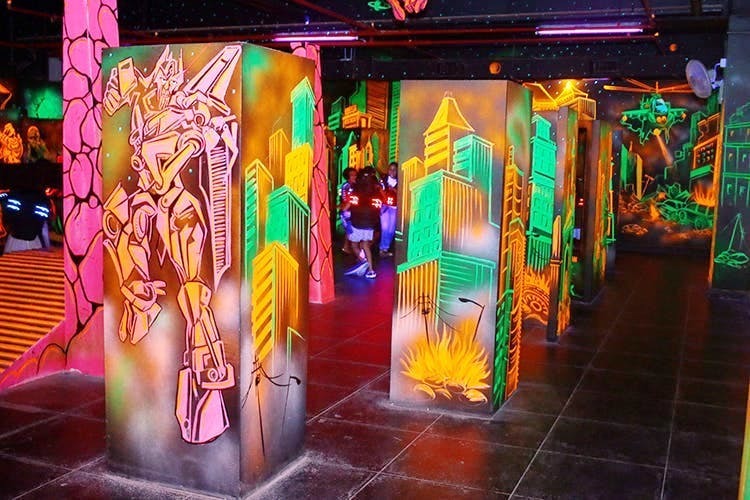 ft. laser tag arena that can accommodate 12 players at once, a bubble football field for 10 players, a complete arcade, PlayStation VR gaming, and a cafe–basically everything that defines awesome. They've also got a dodgeball-vs-machine game where you stand on a platform and try to avoid getting hit by balls coming at you from three different angles (do you even reflex, bro? ).Also, if you've got kids with you, treat them to the kids play area that has trampolines, ball pits, slides, swings and a round-the-clock caretaker to ensure safety. They've got discounted multi-game packages, so if you're ready for a day full of shooting lasers and knocking your friends out in bubble football, we say you opt for those.